this is my first post on the JFKAssassinationforum. When I looked at a Bronson photo of the Dallas Motorcade in Main Street , i noticed a lady wearing a pink headscarf (it seems like there are patterns on the scarf as well as the babushka on it). Her face is a bit recognizable. I compared the color of her headscarf with the color of the headscarf on the Videos from Mark Bell, Marie Muchmore and Charles Bronson's, as well as the photos from Jay Skaggs and Wilma Bond. The color seems reasonably consistent. I also looked at the face of the Babushka Lady on various frames of the Zapruder video. 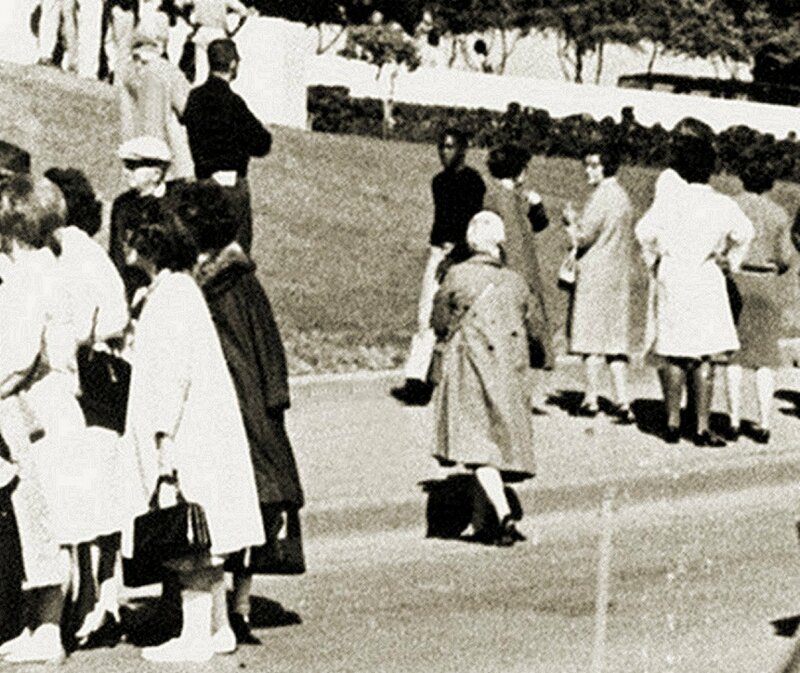 Although the quality in Zapruder is very blurry and pixelated, I had the feeling to have discovered a few similarities with both women. when I was looking for more pictures of this woman on the main street, I discovered a video on the possibly the same person on it, she looks at least very similar. Not sure where in Dallas your images were taken. Just like everyone else, Babushka did have physical limitations. She would have had difficulty traveling great distances whether in a car, (streets blocked), or on foot. Take a look at a good copy of the very beginning of the Bronson Film. That looks like Babushka on the Left standing behind the Water Pool that ran parallel with Houston St. Same color scarf on her head and the same color/bulky coat. From that position Babushka would have then been able to walk down Main St, cut across the grass area that runs between Main and Elm St, and then at some point position herself behind Charles Brehm and his young son. The REAL question is where Exactly did Babushka and her camera go after the shooting? Images you have posted have nothing to do with Babushka Lady and it is absolutely impossible to recognize the face and scarf on photos you have posted. Thank you very much for your post. You´re absolutely right, i forgot to name the locations of the photo and the video recording, sorry my fault. The first picture is a foto taken by Charles Bronson near the "Dallas County Criminal Courts" probably with a still camera Leica Model III. The other picture are screenshots from a YouTube-Video called JFK motorcade, Dallas, TX, Nov. 22,1963 slow motion excerpt from JRY 005. According to the video channel the recording is taken from NW Corner of Market Street and Main, the last intersection off Houston Street. I'm not sure if the Babushka Lady could cover such distances (eg Market Street to Dealey Plaza) during this time. Probably you are right. I was struck first and foremost by the amazing similarity of the colors of the headscarf and the fact that the Babushka Lady occasionally met in front of the Bronson lens (i already knew your screenshot from the Bronson video). Therefore, I thought it possible that the woman wearing the pink headscarf on the Bronson image could be the Babushka Lady. Although I must admit that this is a very presumptuous assumption, her face should be made much more recognizable with today's software. My Intention was it to give the Babushka Lady a face, but i know it´s very,very hard. The Last intersection prior to Houston St is Record St. A Market St. location would put the alleged Babushka even further away from Dealey Plaza. Plus, she would allegedly be trying to beat the JFK Limo moving at roughly 11 MPH to Elm St. Not likely. Will probably have to find out the exact position or place of abdomen of the woman in the video, but somehow it seems to me increasingly unlikely that it could be the Babushka Lady, especially since I found the information when reading the video description that the recordings might be in just a little less was made as one minute before the shots. Perhaps it was simply due to my subjective view that I saw similarities between the woman on the video and the Babushka Lady in the Zapruder video behind Charles Brehm. I appreciate your posting this Thread. Not enough attention is paid to the Movements & Identity of the Babushka Lady. 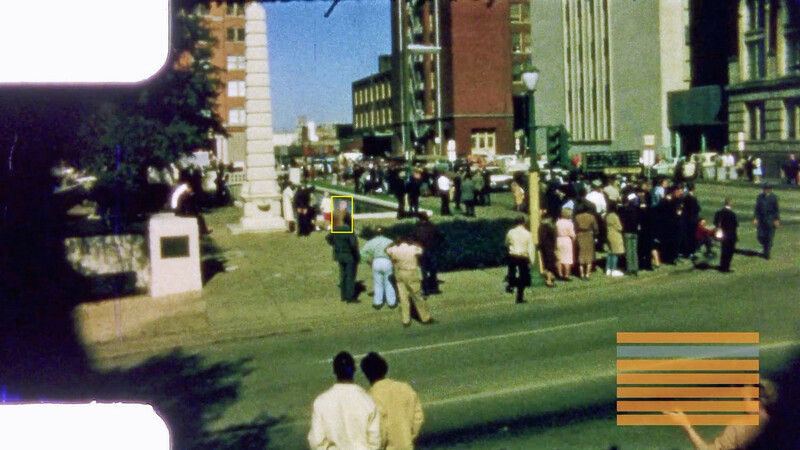 We can clearly see she had a camera which makes knowing the movements and identity of this eyewitness to the assassination extremely Important. The FBI did manage to track down Robert Croft and he departed Dealey Plaza immediately following the shooting bound for Denver via train. 10:00 AM the morning after the assassination the FBI was banging on the Mission Home door where Croft stayed wanting the film from his camera. Croft was a missionary who on the day of the assassination had departed Little Rock, AR with a very short layover in Dallas before heading to his new assignment/home in Denver. Absolutely NOBODY in Dallas knew Croft, yet in under 24 hours the FBI had located and was talking to this completely unknown man. Bearing this FBI rapid response in mind makes me believe that the FBI also found out the ID of Babushka and likewise tracked her down and took possession of her film. Unlike Croft, Babushka hung around Dealey Plaza following the assassination. To believe the FBI was able to identify, track down, and physically contact a completely Unknown person in Denver, but was unable to do likewise to someone that was right there inside Dealey Plaza for an extended period of time is illogical. Again, thanks for this Thread and keep searching & researching. When looking for Babushka you need to look for the strap that goes across her right shoulder and down her back. the strap was attached to a bag she was carrying at her left side. There are lots of look alikes, if you can't see tha bag or strap over her shoulder, then it's not her.